When it comes to new college graduates’ preparedness for their future careers, studies show a great divide between the perception students have of their skills, and what employers see from interviewing and working with recent grads. In areas such as organization, working in teams, and applying skills and knowledge in real-world settings, students were more than twice as likely to think they were being well-prepared for the workforce as employers were. Hire more experienced career center staff – Better-qualified career center staff with hiring experience can give updated career and job-searching advice that reflect the realities of today’s job market, and will be better able to communicate to students what hiring managers are looking for. This will allow students time to improve their qualifications before they graduate. Teach networking and interviewing skills – These are two very crucial skills one needs to get a job, but many students graduate from college not knowing how to network or what to expect in a job interview. Career centers could better promote the opportunities they provide to sign up for practice interviewing sessions, as well as add lessons and practice sessions on networking. Colleges can also hold more career-related events where students can learn about and practice these skills with career coaches or hiring managers, as well as incorporate lessons on networking and interviewing into many different courses. Stress the importance of work experience outside of a degree – Jobs and internships while in school will give students a significant advantage when it comes to job-hunting, as they will be starting the job search with valuable experiences and skills on their résumés that their peers who only have classes and extracurricular activities lack. They also have the benefit of allowing students to explore a particular career path to decide if it is really right for them, and giving them the chance to change direction and explore other options before graduation if they discover it isn’t. Improve soft skills by connecting activities in the classroom to necessary job skills – Many classroom activities that students may see as being an unnecessary nuisance are actually a taste of what is to come when they start their careers. Instructors should emphasize how class requirements and activities like group projects, class participation, analytical essays, and even interactions with their classmates and instructors are precursors to what their careers will require of them. 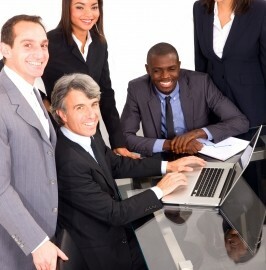 Once students graduate and find work, they will likely find themselves having to collaborate with their coworkers to complete a project, participate in and contribute ideas in meetings, analyze problems, results, and customer feedback to improve a product or service, and communicate effectively and appropriately with coworkers, upper management, and customers. Raising awareness of the similarities between what goes on in the classroom and the workforce may motivate students to take their classroom experiences more seriously. Our solutions use case studies to provide a real-world context for how the skills students are learning in class will be used in their careers. For more tips on how to prepare your students for their careers, contact Labyrinth Learning to learn more about our solutions for Business and Accounting, as well as our Mastery Series. Nearly 60% of students entering community colleges aren’t prepared to take college-level vocational or educational classes and require non-credit remedial courses in math, reading, and writing before they can start on their vocational or academic degrees. Taking months, or even years, of high school-level courses in these subjects before being able to advance to credit courses and start working towards their credentials extends the time and money it takes for students to complete their degrees. The frustration and discouragement this often leads to is apparent in the completion rate: only about a quarter of students who start out taking remedial courses complete a degree in eight years. Washington community colleges are combating this drop-out rate with their innovative program called I-BEST (Integrated Basic Education and Skills Training), which offers credit courses that teach basic math, reading, and writing skills alongside the technical skills students will need once they complete their credentials. Areas in which colleges offer I-BEST programs include accounting, business clerical skills, information technology, nursing, and academic transfer, among others. In I-BEST, students are taught basic academic skills that they will use in their chosen careers in the context of how they’ll be used on the job. There are two instructors in each I-BEST course: a basic-skills teacher and a subject expert. The basic-skills teacher lectures on the subject area for the first part of class, then the students immediately go to the lab portion of class where the subject expert teaches job procedures, applying what students have just learned in the lecture. The program has been replicated by colleges in 29 other states. Accelerated the speed at which subjects are taught: Many students don’t need an entire semester or year of remedial coursework, only strengthening in certain areas. I-BEST fills the gaps in students’ skills by concentrating on what they need to know for their career paths. In addition, the direct connection between academic work and job skills improves retention of learned basic skills knowledge. Increased likelihood of earning a vocational or academic degree: Taking non-credit remedial courses can cause a financial strain, as many students may run out of money for credit courses before completing their credentials or even taking a single credit course. I-BEST offers basic skills intermingled with career courses for credit, allowing students to take the courses they want from the beginning. It also lays out a clearer pathway for what courses to take in order to complete a credential or work toward a degree. As a result, over 80% of I-BEST students have completed their credentials or returned for another quarter. Produces long-term economic benefits: Students who have completed at least a year of college-level classes and earned a credential obtained better jobs and saw a significant increase in earnings. Labyrinth Learning’s Payroll Accounting, 2nd Edition combines case studies, concepts, and hands-on exercises, both in text and in our new Homework Grader feature in eLab, to teach students the theories and practical skills of payroll accounting. Contact us to learn more about how this and our other Business and Accounting solutions can help your students to succeed in their careers. traditional classroom instruction, or utilize a combination of these options, either throughout their curriculum or within a single course. Each option has its advantages and disadvantages depending on factors such as personality, learning style, time commitment, and computer literacy level. Understanding these influences can help you construct your course, whether it is in class or online, to ensure that your students receive the best learning experience. Increased flexibility – Students can access an online course at any time from any computer with internet connection, whether that be at home, the library, or a café. This makes it easier to fit a course into their schedule when they have responsibilities like work, children, or other commitments, in contrast to a traditional class, which would only be offered at certain times that may not fit the student’s schedule and preclude that student from taking the class. Can be tailored to different learning styles – Many online courses come with a variety of resources, like videos, simulations, links, and articles, and the student can choose which resources to use according to how they learn best. 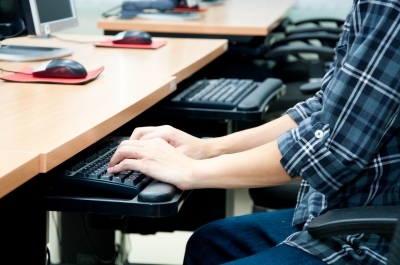 Online courses also allow students to manage the pace of their learning, as opposed to having to adjust to the pace of their instructor and classmates. They can skim material that they already understand, while devoting more time and concentration to lessons which require more of their efforts to learn. Encourages participation in class discussion – The relative anonymity that online courses offer can make students who might not speak up in a classroom more comfortable with participating in online discussions, which can contribute more ideas and add to the learning experience of all the students in the course. Immediate interaction with instructors and peers – Classroom instruction offers in-person access to the instructor and classmates. Students can ask questions and contribute to class discussions, as well as receive answers and feedback immediately, rather than waiting for their instructor or classmates to see their posts or e-mails online. Hands-on activities and group projects can further enhance students’ learning experience. And interacting with instructors and peers in person can also better facilitate personal and professional relationships. Offers a set schedule and structure – For students who may not quite have the self-discipline and time-management skills to complete an online course, traditional classroom instruction can provide that needed structure and motivation to successfully complete the work. Having a set schedule to attend class can help students manage their time more effectively, and having to submit work and take tests in person, which will eventually be graded and handed back in person, adds a certain sense of accountability that students may not feel in an online course, where those same interactions feel more anonymous. 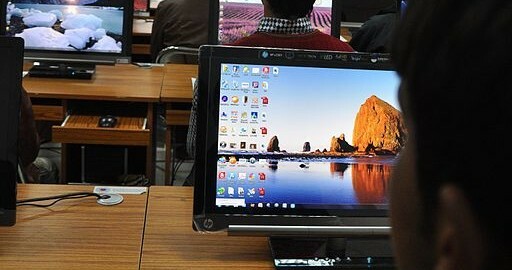 Fewer technology requirements – For students that do not have access to a computer or internet at home, or who don’t have the level of computer literacy necessary to take an online course, a classroom course is beneficial for receiving on-site assistance from their instructor with any technological issues or questions they have. We offer solutions that will optimize your students’ classroom and online learning experiences and help them attain their educational goals. Contact us at Labyrinth Learning to learn more about our full solutions for business and accounting courses, and also beginning- and intermediate-level computer courses. Millennial students have been described in many ways. In one text, “Millennials Rising: The Next Great Generation,” the authors describes millennial students with the words “team-oriented, pressured, confident and achieving.” When teaching millennial students, taking these descriptive adjectives into account can help you devise strategies to specifically target their minds and enhance their learning. Many millennials grew up with involved, interested parents. They tend to learn best from instructors with whom they feel a connection. Including personal experiences in your lectures will make you, and your lessons, more relatable. Millennials grew up working in groups, and they are adapted to learning in this manner. Allow them to collaborate from time to time. You’ll be amazed at the ideas they can generate when allowed to discuss and interact with one another. Millennial students are driven and goal-oriented, but in order to keep your students motivated to continue achieving, you’ll need to provide them with adequate feedback. There’s no need to stroke their egos, but do tell them where they have succeeded, and what they can do to improve. We offer efficient software to make multimedia learning more approachable for both students and instructors. Contact us at Labyrinth Learning to learn more about our materials, which will greatly help you teach your millennial students more effectively. These days, many students are connected to the Internet and to technology nearly 24 hours per day through their smartphones. The use of this technology is changing the way students learn and the way instructors need to think of digital literacy testing for students. It’s common for instructors to assume that because many of today’s students have grown up with technology, they are naturally digitally literate. However, this is not always the case. Just because students are immersed in technology doesn’t necessarily mean they know how to use it effectively. In order to enhance education, instructors should identify skills to enhance students’ use of their devices. They should also focus on teaching the benefits, dangers, and opportunities that come with today’s technology. Teaching technology has moved away from teaching students how to turn on and navigate their devices and on to more detailed, specific topics that allow students to make the most of technology and use it responsibly. We are committed to helping students learn and instructors teach. Our team invites you to contact us at Labyrinth Learning to learn more about our software. When most instructors think about assessing student learning, what often comes to mind are tests, quizzes, and assignments. While these are certainly useful tools for motivating students to learn the material and for assessing student learning, there is another method to consider integrating into your approach. Students generally begin a course with very little knowledge of a topic. They’re aware of the fact that they know very little. When the course has finished, they’re much more knowledgeable, but it’s hard to determine exactly how much they have learned — or which topics they learned well, and which are still unclear. One way of assessing student learning is to ask a series of questions early in the course, and then repeat that same series of questions at the end of the course. By comparing the before-class and after-class answers, you can determine exactly which topics students learned well and which are still foggy. To implement this method, you’ll need to start by outlining the key concepts of your course. Ask several big-picture questions about each topic that you feel will effectively evaluate whether a student understands that topic. 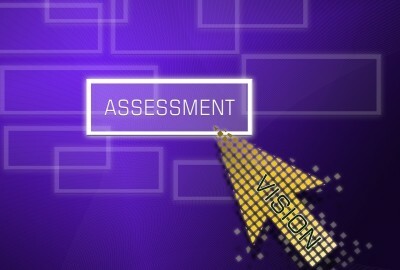 Administer this assessment at one of the first classes, and again at one of the last. You could also choose to use this approach on a topic-by-topic basis. Ask a series of questions before each unit and again after each unit. For more information regarding our student learning solutions, we invite you to contact us at Labyrinth Learning today. In order to get the most out of their education, students need to be able to learn efficiently and in a way that encourages them to retain the material, rather than simply forget it once the test is over. Understanding some common misconceptions that students have about learning will assist you in designing a curriculum and teaching style that fights these misconceptions and results in well-educated, prepared students. Misconception #1: Knowledge is just a slew of facts. A common student misconception about learning is that building knowledge is about learning more facts. In reality, knowledge is being able to tie these facts together, see how they relate, and understand their deeper meanings. Making sure you explain how individual concepts are related to one another will help break through this misconception. Misconception #2: Natural talent, not hard work, makes someone good at a subject. Provide your students with feedback throughout the semester, letting them know that their work is paying off and that they’re improving. They’re not just naturally talented; they’ve been putting forth effort to succeed. Misconception #3: You can learn effectively while multitasking. This common student misconception about learning is quite detrimental. Student think they learn well while also doing other things. Set policies, such as no texting during class, to encourage them to focus on the singular task of learning. They’ll find they have an easier time absorbing the material. We invite you to contact us at Labyrinth Learning to learn about our accounting software for college students. Administer a few (3 – 5) unannounced quizzes throughout the semester and make them worth a potion of your students’ overall grade. This will prevent students from missing class — they won’t want to miss out on the quiz grade. Make it clear that these quizzes cannot be made up if a student is absent. If you have students who are missing class more than once in a while, send them an email. Express concern about their poor attendance, and encourage them to attend more often in order to improve their performance. Knowing that you’re aware of their absence is often enough to drive them back to class. Pass out handouts that explain helpful concepts, but don’t post them online. This way, students must attend class in order to obtain this vital information. If students like attending class, they’ll keep coming. Almost any topic can be made more interesting by including discussions in classes and making an effort to relate the concepts to daily life and real world situations. Contact us at Labyrinth Learning to learn about our teaching software that’s useful for improving student attendance while making the learning process easier.